When spring is just around the corner in Cleveland, we know that it’s pancake and local maple season, with Sunday breakfasts being served throughout the area. Geauga County in particular is known for their pancake breakfasts. I had always wanted to go to one, but never got motivated enough. I made it to two this year – on March 19 and on April 2. Most pancake breakfasts are served on Sunday mornings in March, although a couple run into mid-April. 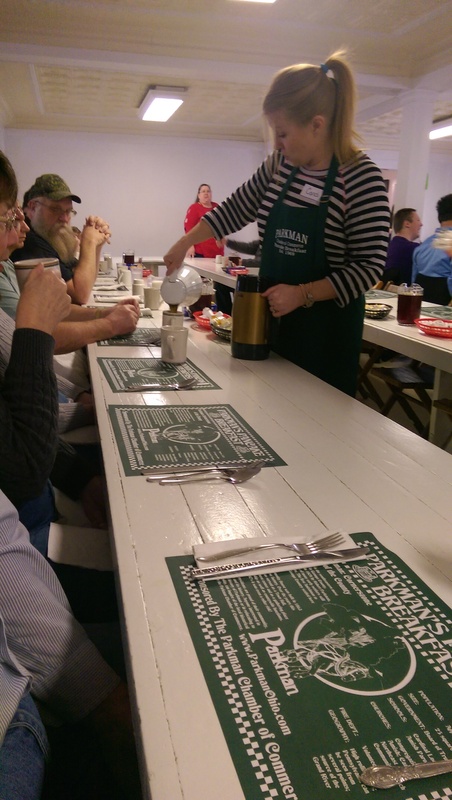 Geauga County is known for its maple syrup, and the pancake breakfasts in the area serve genuine Geauga County maple syrup, tapped fresh. My former neighbors in Solon go every weekend in March, so I joined them for the one in Parkman. It was worth waking up early to meet them and drive out 422 just past Route 528 to the Parkman Community Center. I got to catch up with the patriarch of the family, and we enjoyed an all-you-can-eat feast of sausage and pancakes with beverage (coffee, water and milk) for just $8. I managed to eat three pancakes and three sausage patties. Some of my fellow diners did better than that, but I was happy with my meal. Word of warning: don’t get the water unless you like sulfur-tasting water. Crystal from Eat*Drink*Cleveland warned me about the coffee ahead of time, but since I use lots of cream and sugar anyway it wasn’t an issue. The straight water was. This community fundraiser sponsored the Parkman Chamber of Commerce is a well-oiled machine. You pay as you walk in and get in line. Gingerich Farm sells their maple products, and the Girl Scouts sell their cookies to the waiting hordes that winds their way through the room. The hostess waits until a stretch of table clears before leading the next bunch in. The serpentine table allows diners to sit on one side and the servers to walk in between and serve up the goodness. I loved the fact that they use real plates and silverware and serve local maple syrup in pitchers that sit on the table every couple of seats. I didn’t love the fact that the kid across from me stared at me the whole time. It was unnerving. 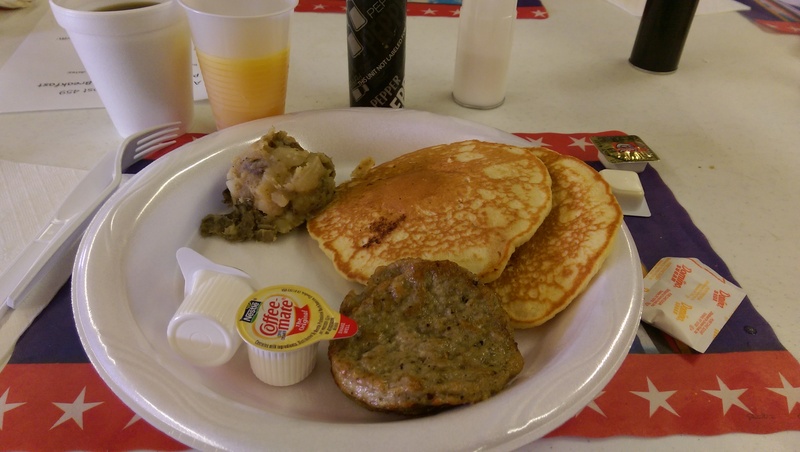 One of my friends recommended I go to the Burton American Legion Post for their pancake breakfast, because she felt it was the best one in the area. Burton is well-known for their numerous pancake breakfasts, including the Rotary Club, the Century Village Museum and other groups. Burton has been serving pancakes every spring to over 20,000 guests every March since 1951. The American Legion Post is located just north of the square at 1405 Goodwin Street and serves from 9 am to 1:30 pm, which works well with my not being a morning person. It is a smaller venue, but there are apparently two floors. 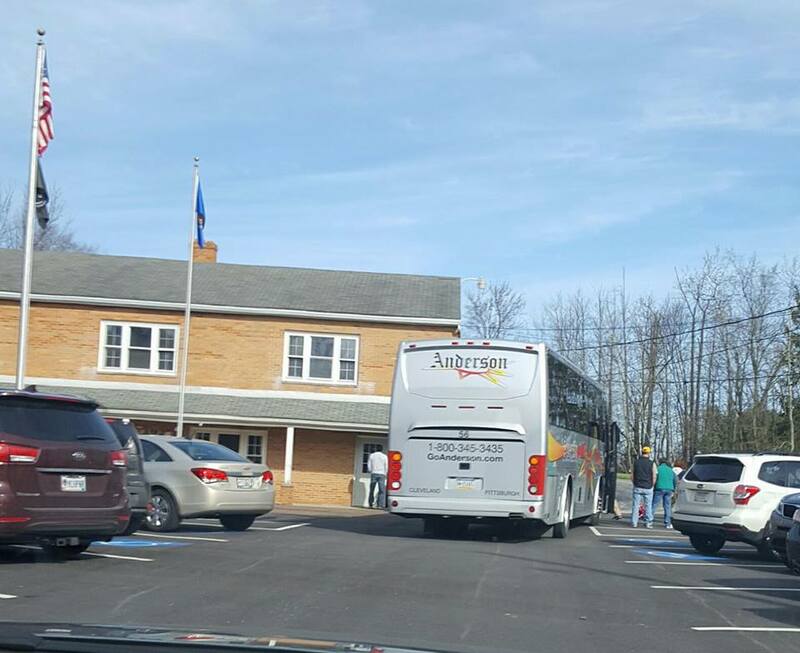 My friends actually were there about 45 minutes before I was, because T. posted a picture of the bus that had just rolled up. Apparently they come from Pennsylvania just for the pancakes. The guy said they started out with a few people and more and more join them every year. When I got there the bus was still there (they were seated upstairs), but my friends must have just left. I paid my $10 and lined up. They not only served pancakes (blueberry or buttermilk) and sausage, but also had delicious home fried potatoes and scrambled eggs (I didn’t get the eggs since I am allergic). The pancakes were fluffy and delicious, but my favorite was the potatoes. Diners were free to get back in line for more, so I went back a second time for a blueberry pancake and more potatoes. They also had plenty of coffee and orange juice. I drank a couple juices and a couple coffees. I got a kick out of the coffee spill catcher they made out of a two liter bottle. The ladies told me they’ve been using it for years. I wish I had taken a picture. 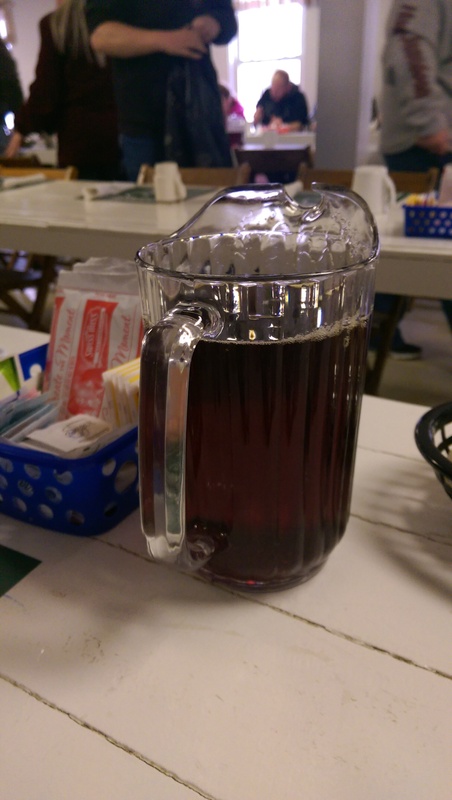 The fresh local syrup was on the tables in squeeze bottles, and the ladies kept walking around to make sure they were full. The tables also had salt, pepper and Heinz ketchup. I sat by myself, but enjoyed chatting with a couple guys near me – and eavesdropping on a table of older diners comparing their flip phones and phone plans. Be sure to put a pancake breakfast or two on your Must Do list next March. 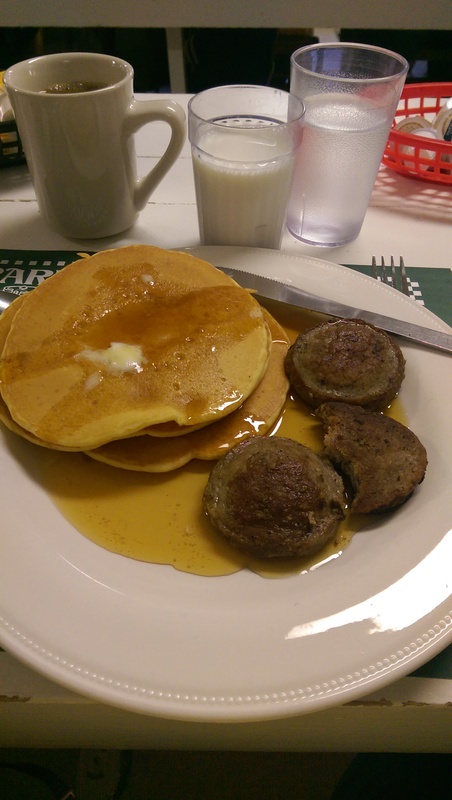 There are a wide variety of pancake breakfasts in the surrounding counties and specifically in Burton to choose from. And if you don’t want to wait a year and want some now, as the Burton website explains, “You can still have unique & delicious pancakes even after the season ends. All year-round many local restaurants, civic organizations and lodging facilities serve pancakes and offer pure maple syrup for your enjoyment!” Just head on out to Burton – I recommend stopping to walk around at LaDue Reservoir, Punderson State Park or in Amish country in Middlefield and the surrounding towns after breakfast.